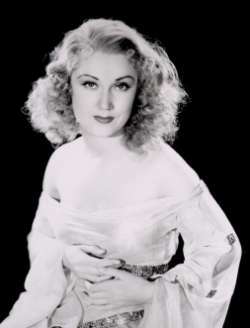 Fay Wray was born near Cardston, Alberta, on 15 September 1907, but her family moved to Arizona when she was three years old, and later relocated to Salt Lake City, Utah, in 1912. According to Wikipedia, her first film role was in a short historical movie which was sponsored by a local newspaper! Although she appeared in around 100 movies, she is best known for her role as the blonde, beautiful, Ann Darrow in the classic movie "King Kong" (1933). In 1928, Wray was cast as the female lead in the movie "The Wedding March" director by Erich von Stroheim, and although the film was a financial failure, it was her first leading role. Fay was married three times, first to screenwriter John Saunders on June 15, 1928 when she was 20. Her second husband was screenwriter Robert Riskin whom she married in 1942, and her third husband was Neurosurgeon, Dr Sanford Rothenberg. For her contribution to the motion picture industry, this wonderful actress has a star on the Hollywood Walk of Fame. After her death she received a posthumous star on Canada's Walk of Fame in Toronto on June 5, 2005. In her birth place a small park near Lee's Creek on Main Street in Cardston, Alberta, is named "Fay Wray Park" in her honor and the small sign at the edge of the park has a silhouette of King Kong on it. She continued acting in films, but by the early 1940s her appearances had grown sporadic, however she appeared frequently on television, making her final appearance in 1980. 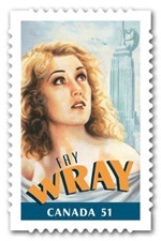 In 2006 Canada Post paid tribute to this beautiful actress by producing a postage stamp honouring her. At the time, she was one of only four actors who had ever been featured on a Canadian postage stamp. Her autobiography, "On the Other Hand", was published in 1988, and sadly, she died on August 8th 2004, in New York at the age of 96.